Lord Chatham … Lord Lieutenant of Ireland? Some background, and I realise this is one of the most intricate and complicated topics in European history but I will have to be brief. In May 1798 Ireland (long disaffected and a target of repeated attempts of the French to invade the British Isles) exploded into rebellion. The rebellion was quickly put down, but the Lord Lieutenant at the time, Earl Camden, a civilian, was replaced by Lord Cornwallis, a military man. Pitt the Younger’s government decided to force through an Act of Union binding Ireland to Britain, dissolving the Irish Parliament and creating the United Kingdom of Great Britain and Ireland in January 1801. A great deal of patronage and corruption was required to persuade the Irish Parliament to dissolve itself (read Patrick Geoghegan’s The Irish Act of Union (2000) if you want to know more: it’s excellent). Part of the fallout was the collapse of Pitt’s own administration when the King got wind that Pitt was possibly considering making Catholic Emancipation (allowing Catholics in the United Kingdom to sit in Parliament and hold high office) part of the Union package. As far as the King was concerned this would lead to a violation of his Coronation Oath to defend the Anglican establishment. The resulting ruckus led to Pitt’s resignation and half his cabinet followed. Cornwallis, the Irish Lord Lieutenant and up to his ears in the Catholic business, was one of those who followed Pitt out of office. Lord Chatham, Pitt’s own brother and an opponent of Catholic Emancipation, stayed on under Pitt’s successor Henry Addington. Given the circumstances it was clear Cornwallis was going to have to resign with Pitt, so to find the King ruminating on a possible replacement for him is not surprising. The main problem was that the shape of Ireland’s post-Union government was not clear. Very possibly there would not be a Lord Lieutenant at all, and if there was then he might well be of no more consequence than his county counterpart in Britain (county lords lieutenant still exist but on a purely ceremonial scale nowadays). One of the main reasons for the Union in the first place had been to tie Ireland’s government closer to London. Edward Cooke, one of the Irish under-secretaries of state, wrote to Lord Camden that “the Administration of the two Islands must be one” (18 July 1800, Kent RO, Camden MSS U840/C104/1). How this was to be achieved in practice was not clear, and remained in a state of lamentable confusion for decades after the Union was so hurriedly implemented, unfortunately much to Ireland’s detriment. What startled me most about finding the King’s letter was, firstly, the idea of Lord Chatham as Lord Lieutenant (…because let’s face it, this is John Pitt, 2nd Lord Chatham, known by all and sundry as the “Late Lord Chatham” we’re talking about) and, secondly, the fact that the King seems to have originated the proposal. Chatham was much more of a courtier than his brother was and had spent much of the previous summer drilling his regiment at a camp near Windsor. He and his wife seem to have been in charge of entertaining the Royal Family when they came to visit the encampment and Chatham had obviously made an impression. On 12 February 1801 the King wrote to Addington that “I truly bear the warmest affection for him [Chatham]” (Pellew I, 304). Chatham did in fact take on the Ordnance but not for another few months. I do find it interesting that the King seems to have been taking it upon himself to make so many of the arrangements for his new government in February 1801, at least before he caught his chill and slid into a brief relapse of mental illness. I also find it interesting that the King obviously took such a personal interest in Lord Chatham— who, after all, took the King’s side in the Catholic Emancipation debate. Sorry it’s so long, but I found this fascinating and felt I had to share. It’s a painting by Henry Perronet Briggs (1828) in the Royal Maritime Museum, Greenwich, and depicts the visit of King George III and Queen Charlotte to Portsmouth on 24 June 1794 to congratulate Admiral Lord Howe on his victory over the French at Ushant (the battle became known as the “Glorious First of June”). 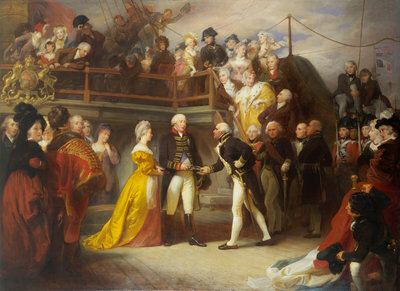 George III is shown handing Howe a ceremonial diamond-hilted sword on the quarterdeck of Howe’s flagship, the Queen Charlotte. Various members of the Royal family and the court watch. I can’t identify too many of them off hand, but conspicuous among them are the two main characters of my novel: prime minister William Pitt the Younger on the far left, and (immediately to the right of the chap in the rather dashing red and gold pelisse) Pitt’s brother John, Second Earl of Chatham. Chatham was, of course, First Lord of the Admiralty at the time and so had a prominent role in the celebrations. I think it’s pretty cool. One day I might even go and see it in person!